We're finally here!!! After waiting for months for this particular day... I finally set eyes on the one of the seven great wonders of the world.... I was ecstatic baby! Even on the way there which took about 2 hours from Beijing, I was hyperventilating. OK.. that's a bit exaggerated. But the driver took notice how I was squirming in my seat, impatient to get out. LOL. A cute bus driver for that. I believe there are many entrances to the Great Wall. We just happened to enter through the JuYong Pass. 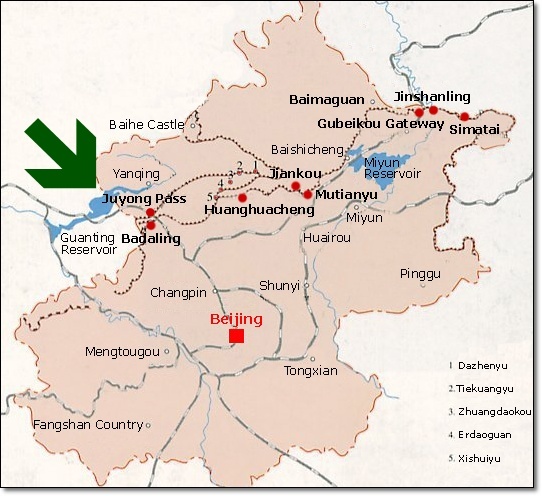 I read from the information bulletin, that Juyongguan (Juyong Pass) is a famous ancient pass of the Great Wall in north Beijing as depicted on the below map. That's only the UPPER half of the wall. The whole Great Wall of China could be illustrated below. 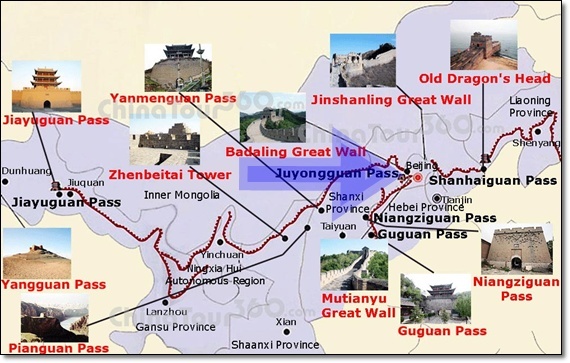 See how extensive the Great Wall of China!! I think I should come again just to explore the whole wall. Wouldn't that be great? Alas, we were given only 2 hours at JuYong Pass. I didn't even try to reach the second tower. Uwekkk.. uwekkk.. 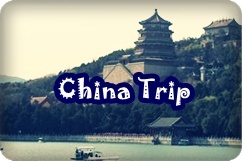 It lies in the Jundu Mountains, the ending section of the Taihang Mountains. At the base of JuYong pass. There are lots of merchandise being sold here. My advise: DON'T BUY!!! It's damn expensive! Better buy at the open market back in Beijing. But the small stuffed panda magnet is found there. Kinda regret not buying it. LOL. Love locks. People tend to leave their locks there as sign of everlasting love. I started my way upwards with Fie. And reached the first tower. Went up a flight of stairs... and walla! I honestly thought I've reached the highest tower. But the view from the back proved likewise. Hehehe. So being discouraged and knowing that time is running out, I stopped climbing and went back down. The stairs were uniquely narrow and steep. One person at a time. 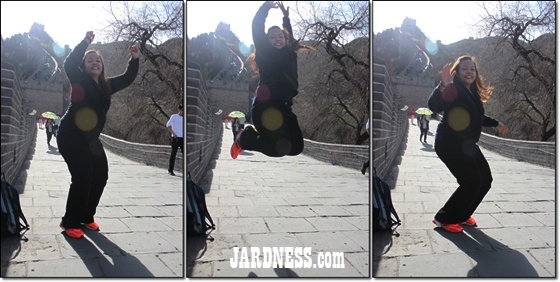 Am soooooo HAPPY to step foot at the Great Wall of China! Hoorayyyyyy!!! Moving downwards, we chanced upon a stack of weaponry. I think its for the Oriental Picture service where ppl get to wear costumes. RMB 50 per pic. Guess it is always easier going down then going upwards, right? I felt the time spent there wasn't enough and plan to come again in the future. Who wants to follow me? When all the 12 people gathered near the exit, we then headed to Beijing to visit the famous Dong Hua Men Night Market. Hope you can stomach some fried scorpions on sticks for the next blogpost. Ihikzz..
kalau nak terberak tahap serius, mau berterabur time naik tannga tu.. huhuhuuuuuuuuuuuuuuuuuuuuuu -_-"
@speedrider.. hhahaha.. pernah ade pengalaman ke bro? Memang sah lah ko happy jard bila tgok pic ko yang melompat keriangan tu..gila babe, siapa yang ndak happy kan..mau2 lagi tempat yang the whole world know about it...syabas jard..next time ko nak kesana lagi, ko ajak lah aku sekali ya..insyaAllah..
owh owh... tak naik sikit lagi ke Jard, kat atas sikit, sebelah lereng bukit tue ada souvenir shop, boleh tempah plaque tembaga yang boleh engrave nama kita. kira macam sijillah kita dah panjat Great Wall..